Are you looking for an easy, effective and free way to clean up, repair and speed up your PC? 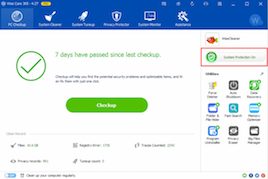 WiseCare 365 Pro ($39.95 value) is a great program that will help you do all that. And thanks to WiseCleaner.com staff, we are happy to offer you the premium version for free. How to Get the Giveaway Version? Easy! Simply click here to download the giveaway version of WiseCare 365 Pro. This version is valid for 6 months for free and supports upgrading. Hurry up and download WiseCare 365 Pro because the giveaway is running from Jan. 31 until Feb. 5. Enjoy using WiseCare 365 Pro for free!